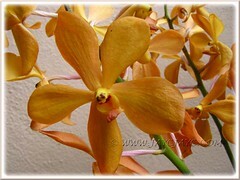 Shopping for orchid plants had never been that quick and easy for us before this! We got some last month, not from the garden nurseries where one would usually procure them but from the church that we usually attend, after the Eucharistic Mass Celebration. Strange, huh? 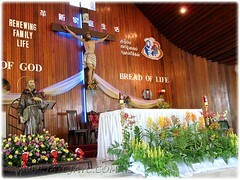 Well, the Church of St Francis of Assisi in Cheras, Kajang, spent quite a sum to elaborately decorate inside out with beautiful bouquets of cut flowers and potted plants on the occasion of its Parish Feast Day that was celebrated on Sunday, October 9. 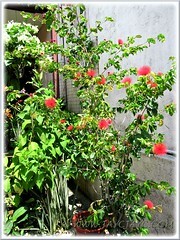 Thus, to recoup some of the expenses, the potted plants were sold at cost. The only snag was WYGIWYS (what you get is what you see) and they could only be collected from the closed Church two days later, meaning unwatered and in an enclosed building. 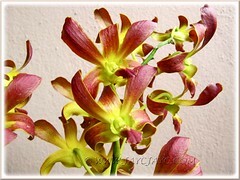 As it was for a good cause, John and I brought home 4 pots of orchids and 4 pots of Celosia argentea, regardless. As expected, there were some casualties. 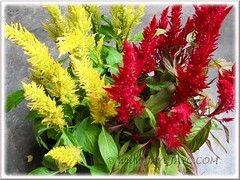 We got to enjoy the annual Celosia argentea (Plumed Cockscomb) for only two and a half weeks before they started withering one by one. It just took one plant to lead the whole lot to their final resting place! 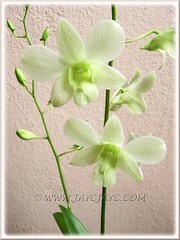 So far, all the orchids are thriving well except for the one with white flowers that had lost all its foliage and doesn’t look at all promising. Aargh! We’re excited that the Red Powderpuff Plant had self-sown a seedling for us, just perfectly sitting in an unclaimed soil-filled pot below it. 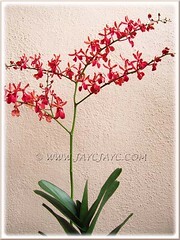 We had tried to propagate this red beauty with stem cuttings a few times before but never successful. Even collecting its seeds is almost impossible – if at all we recall that there had been a seed pod developing, it would had exploded and seeds gone missing by the time we remember to collect them. Very tricky indeed! 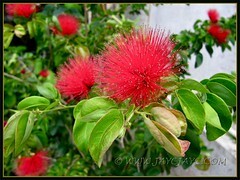 Another self-seeded plant that wants a permanent residence status in our tropical garden and most welcomed by us. We just love this burgundy-coloured herbaceous perennial that is native to Brazil and Southeast Asia. 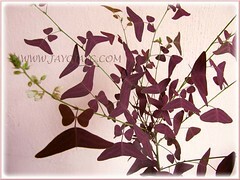 As captivating too are its leaves that are unusually shaped like the butterfly’s wings or aircraft, hence aptly given the other common names, Red Butterfly Wing and Aircraft Grass. This late bloomer is finally thriving rather well. Was it a result of us feeding it with chopped banana skins, we wonder? It seems to be loving them and flowering pretty well too. A pity though that the current flush of flowers are not setting fruits except one, probably due to heavy pours almost daily of late. We harvested the one and only fruit it rewarded us, a few days ago. Our fruit that took about two and a half months to ripen was smaller than the usual size and contained only 2 teaspoonful of edible contents. Too bad that it was insufficient to make a decent glass of refreshing drink! 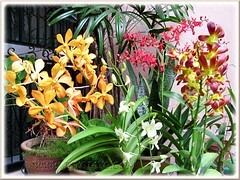 Nevertheless, it was fun to experience all this blessed happenings in our garden as if seeing our children come of age. 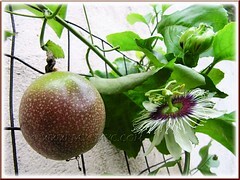 Hope to enjoy more of the homegrown passion fruits in future. Eeeek! We just detest these horrible garden pests. Due to skin sensitivity, health and environmental reasons, we’re most wary of using pesticides in our garden to rid of them. 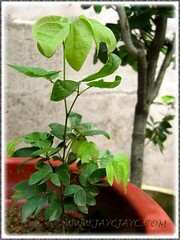 At least a dozen infested branches of Mussaenda philippica ‘Aurorae’ were chopped off that evening when this image was captured. 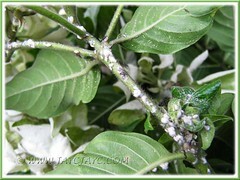 They love to infest persistently our White Mussaenda tree. Time and again, we had pruned down heavily on this lovely tree, only to have new growth covered again eventually by dense colonies of these creepy crawlies that stunt foliage growth and make them unsightly. Probably, the much-loved White Mussaenda tree that has been providing good shelter for the blue hydrangeas below, has got to go! We’re toying with this idea but just the thought of removing an aged tree with roots and all really gives John and I the shivers as our backs may not withstand the strenuous job ahead. We’ll see! We did mention in our September garden update that we tried to germinate the single seed produced by our Cardwell Lily. 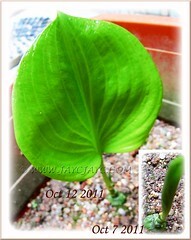 Well, we’re extremely happy to observe that a leaf had sprouted during the first week of October 2011 and to date, it is progressing well. However, our experiments have shown that somehow plants propagated by seeds grow somewhat slowly and are not as luscious as those propagated from offsets that form on mature bulbs. Oh I love that butterfly wing plant. 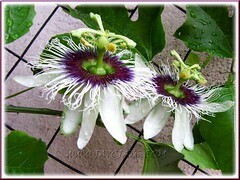 I have seen photos of another similar plant that has green and red stripes like swallowtail butterflies. Hi Gillian! Yes, I’ve also seen that lovely distinct green/red variegation so many moons ago… too bad, I haven’t sighted it again at any of our local nurseries since then. Thanks for dropping by.